Hotel-Online » News » Survey Asks: What Sacrifices Are Your Guests Making for a Mobile Check-In Experience? [Santa Cruz, Calif. – August 15, 2016] – As travelers themselves, hoteliers experience some of the same irritations their guests face when it comes to the room assignment process. 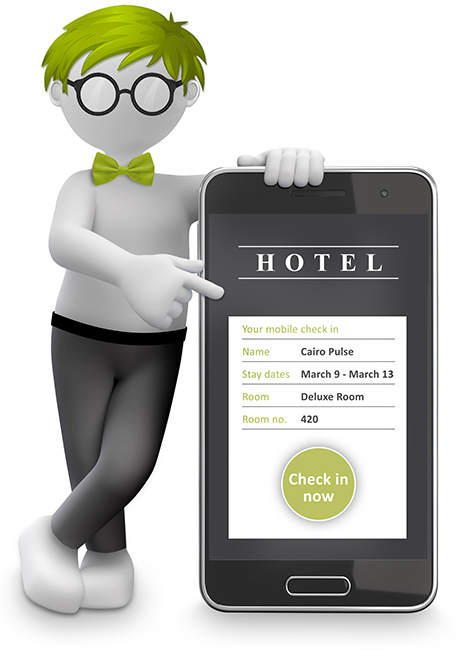 With mobile check-in via smart devices growing in popularity, frustrations arise when travelers arrive early or check in via mobile app but they still have to wait for their exact room type to be made available upon arrival. hospitalityPulse Inc. is asking hoteliers to take a short “Check-In Experience Survey” that reflects upon their most recent experiences. The purpose of this exercise is to help hoteliers identify problems with their own room assignment processes and implement a solution for an improved guest experience. “During the recent HITEC show, we asked hoteliers visiting our booth about their check-in experience,” said Pierre Boettner, hospitalityPulse CEO. “We wanted to know: 1) Did they check in remotely using the hotel’s mobile app or arrive earlier than planned? 2) If yes, were they assigned a room immediately and was the room ready upon arrival? and 3), Once in the room, did it meet their expectations and match the features they requested at the time of booking or did they have to sacrifice preferences for the sake of being given a room – any room? To participate in the “Check-In Experience Survey,” click here. The 10-question Check-In Experience Survey is LIVE today through September 15th, with results being revealed in October. Those wanting the industry overall to do a better job in pre-assigning guestrooms, refining availability and streamlining the mobile check-in process, should start the survey NOW. For more information on hospitalityPulse, the technology leader in automated room assignment solutions, visit www.hospitalitypulse.com.